Definition of Sweat Lodge: What is Sweat Lodge? A Sweat Lodge is a small, temporary structure that is created for the purpose of a sweat ceremony or ritual and can be described as a ceremonial sauna. The Sweat Lodge ceremony, or purification ritual, accompanies important events such a rite of passage ceremony, marriage or part of a Spiritual Healing ritual or a Smudging Ritual. The sweat lodge is also called a medicine lodge, medicine house, or simply a sweat. Vapour Baths were the Native American equivalent of a modern day sauna and these are also described in this article. Only a Medicine Man has the right to build a Sweat Lodge. The building of a sweat lodge is his responsibility but he has helpers who work to build the sweat lodge under his direction. The sweat lodge in usually a temporary structure and built as a domed structure. Stones were either heated in an exterior fire. The hot stones were placed in a pit in the center of the Sweat Lodge and cold water was poured on them to create the steam that would purify and cleanse the participants in the ritual. "...an everyday luxury by those who have the time and energy to indulge in it; and also used by the sick as a remedy for nearly all the diseases which are known amongst them." In his description Catlin explains that the Vapour Baths (or public sweat lodge), were set away from the village. 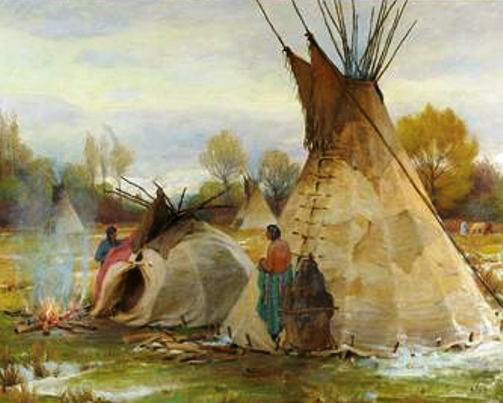 They were housed in a tepee which contained a bathing crib. Red hot stones were heated outside the lodge and carried in and placed under the bathing crib. The bather threw cold water over the red hot stones releasing a profusion of exhilarating vapour which was drawn into the lungs and pores. During the bathing the lodge is tightly shut. When finished the bather would then plunge into the cold, nearby stream.